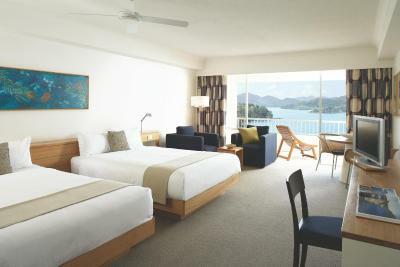 Lock in a great price for Reef View Hotel – rated 8.4 by recent guests! The view !!!!!! You won’t forget it ever in your life !! The best views !! We booked the terrace suite in the 17 th floor and it was unforgettable, we didn’t want to leave :( The view and the decoration, the staff , everything was super nice , we loved our stay. The king room overlooking the ocean was amazing. The room is a bit out-dated for what we paid, especially the bathrooms. The in room breakfast was huge! Serena our waitress at the Beach Club was amazing. She really made the night most memorable for my finance and I. She arranged along with Kirsty the Restaurant Manager for my proposal to now fiancé most amazing. The staff throughout the resort were exceptional- thank you and we look forward to returning next year. Really liked the size of the rooms and the bathroom. It was comfortable with a balcony. Also liked the main resort area with the pool. The view was amazing, beds are comfy but the room needs updating - air con is not great and the bathroom needs to be redone. Overall, amazing! free upgrade of our room to water view. Friendly staff and also very helpful. The ease of getting around with the free shuttle and the option to rent a buggy (golf cart). 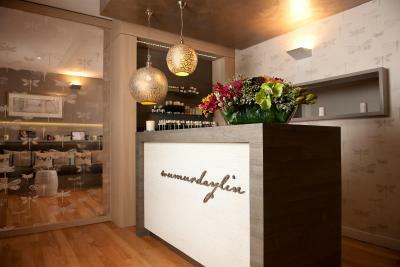 Everything, the rooms, facilities, people, ambience. 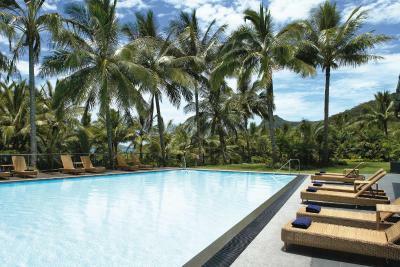 Reef View Hotel This rating is a reflection of how the property compares to the industry standard when it comes to price, facilities and services available. It's based on a self-evaluation by the property. Use this rating to help choose your stay! 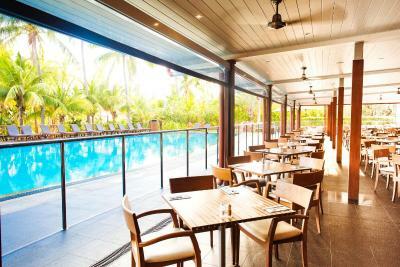 Located directly opposite Catseye Beach, Reef View Hotel features a restaurant, bar and outdoor swimming pool. 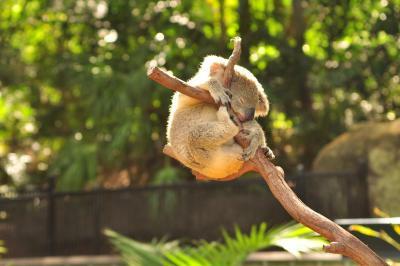 Each room offers free WiFi and a private balcony overlooking the gardens or the Coral Sea. 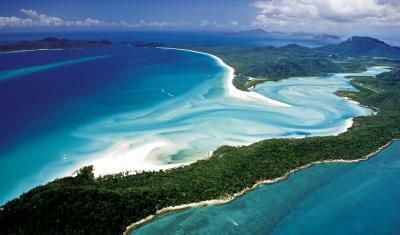 Free return Hamilton Island Airport transfers or marina to hotel transfers are included. 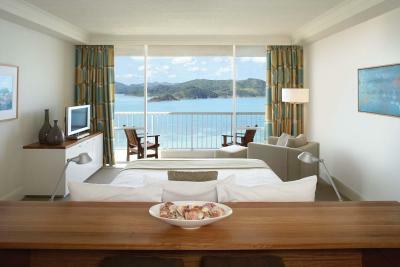 Reef View Hamilton Island offers modern rooms with a furnished balcony, plus a bathroom with a separate bath and shower. All rooms include air conditioning, a refrigerator and a flat-screen TV with Chinese TV channels available. Buffet breakfast, light lunches and an à la carte dinner menu are served in the Pool Terrace Restaurant, overlooking the 100 feet heated swimming pool. The Reef Lounge offers a selection of beer and wine. 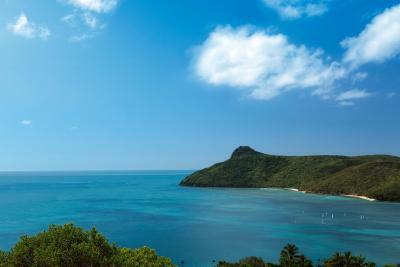 Guests have free access to the island’s fitness center, sauna and tennis courts. 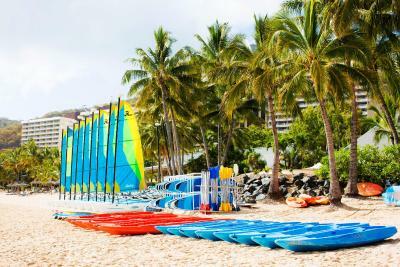 Guests enjoy free use of all non-motorized water sports equipment, including windsurfing and snorkeling gear. Staff are able to converse in English and Chinese. 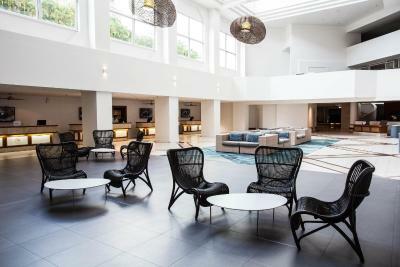 Free WiFi access is available at the Reef View Foyer & Lounge and at various areas throughout the property (download limits apply). 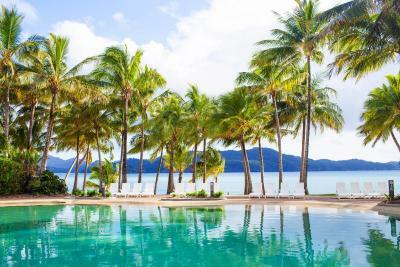 This is our guests' favorite part of Hamilton Island, according to independent reviews. When would you like to stay at Reef View Hotel? Features a large bathroom and large balcony with views of the resort grounds and pools. 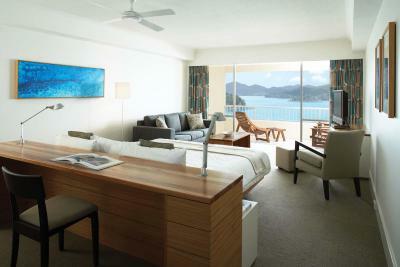 Spacious room with large bathroom and large balcony with beautiful views of the Coral Sea. Children under the age of 12 years stay for free when using existing beds and eat for free when dining with parents in selected restaurants. Please note that the rate is based on 2 adults and up to 4 children under 12 years. 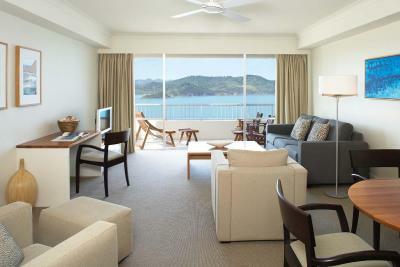 Located on the top floor, spacious suite opens out to stunning water views. This double room features a balcony, seating area and kitchenware. 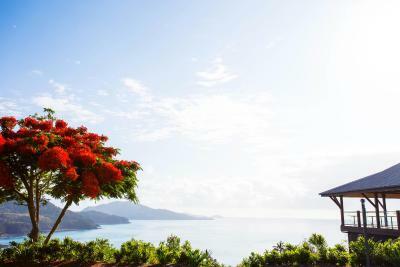 House Rules Reef View Hotel takes special requests – add in the next step! Debit card Reef View Hotel accepts these cards and reserves the right to temporarily hold an amount prior to arrival. 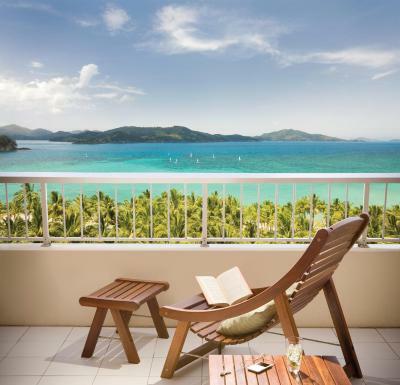 Reef View Hotel accepts these cards and reserves the right to temporarily hold an amount prior to arrival. 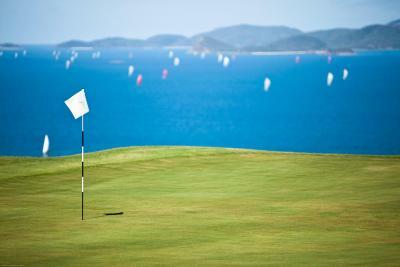 Please note that due to refurbishments, the Golf Course and the Clubhouse at Hamilton Island Golf Club will be closed from 1 April until 15 April 2019. Please note that there is a nonrefundable 1.25% charge when you pay with a Visa or Mastercard credit card. Please note that there is a nonrefundable 3% charge when you pay with an American Express credit card. 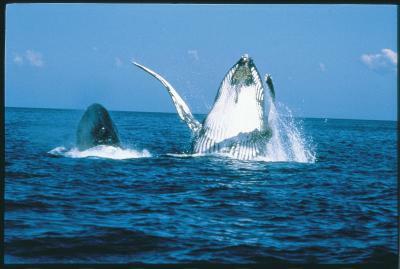 Please inform Reef View Hotel of your expected arrival time in advance. You can use the Special Requests box when booking, or contact the property directly using the contact details in your confirmation. They charge for everything. 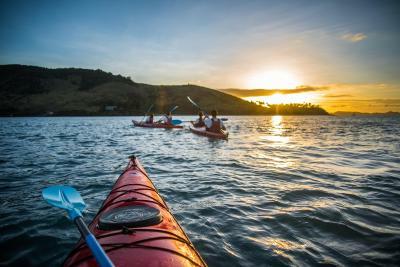 For the kayaks, the snorkel gear, the windsurf . In most of the hotels around the world they don’t charge for this since they are sports that don’t use fuel. 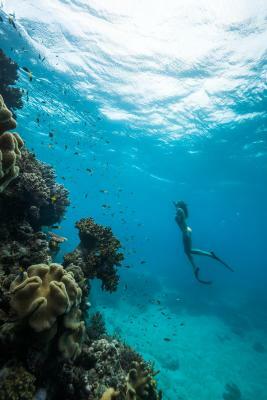 We have gone to different hotel chains around the world like Club Med, De Cameron, Hyatt, Sheraton, Melià and they never charge for using a snorkel ! Rooms and the outside of the hotel were depressing, rudimentary and tired. The hotel and rooms don't match the photos online. Pool Terrace was good in terms of food offering and quality. There was a constant stream of ‘traffic’ but inside and outside the hotel. Guest arrived all day everyday. Outside there were golf carts everywhere. It felt chaotic and hectic. Clean hotel. 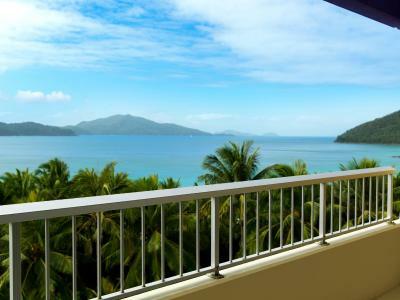 Beautiful balcony view. We stayed in 3 different rooms. All had cracked sinks and one cracked shower tiles. The carpet tiles were aging and sticky. One of the rooms smelled damp and vaguely like vomit. The décor was tired and the hotel not overly clean. Shower heads are fixed and too low for an average height man to fit under them. Water either too hot or not hot enough. Check in was slow and frustrating. We had to move rooms because of building works outside our room which apparently where scheduled until August. Room over priced for what we got. All the workers are very helpful and nothing is a problem! The room we stayed is quite big with the sea view, very nice. The rooms and main lobby area were a bit dated and could probably do with some renovation. Lovely stay, perfect location with stunning views over Catseye beach. The room was clean and the staff at both check in and check out were warm and welcoming. The hotel bar was quiet and relaxing with lovely cocktails. The bathroom needs a major renovation. Really lively destination very easy to get everywhere. 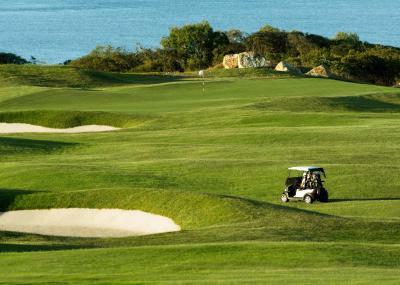 Golf buggies are a great way to see the island. You have to pre book restaurants otherwise your options are limited.